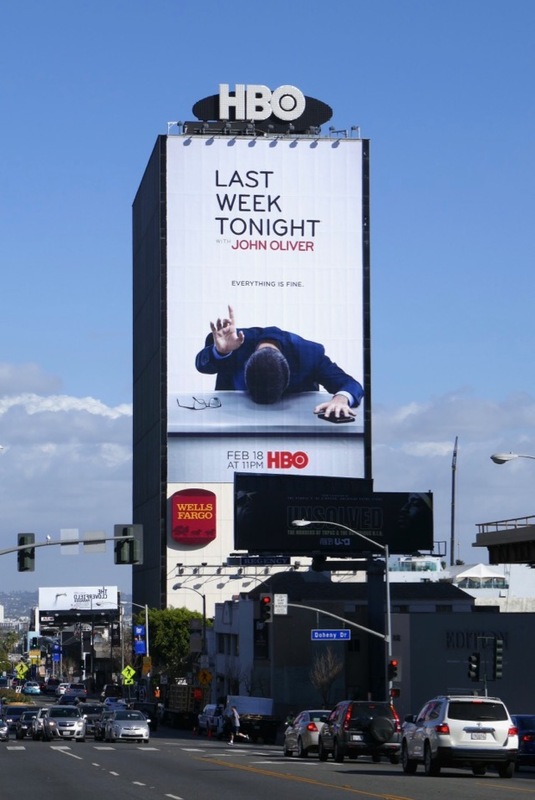 How many times in the past eighteen months have you just needed a moment, to gather your thoughts or simply bang your head against your desk in utter disbelief. 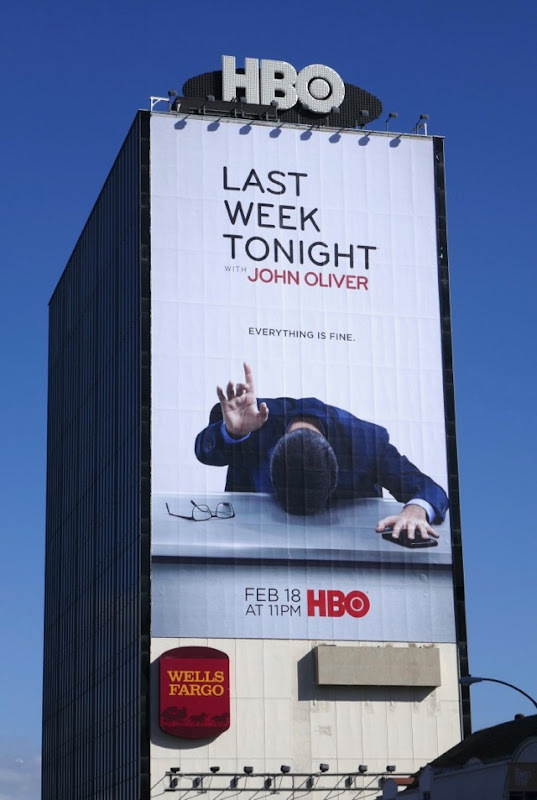 This key art for the fifth season of Last Week Tonight with John Oliver really captures the exasperated feeling of a nation, or quite possibly the world, with the current administration in the White House. 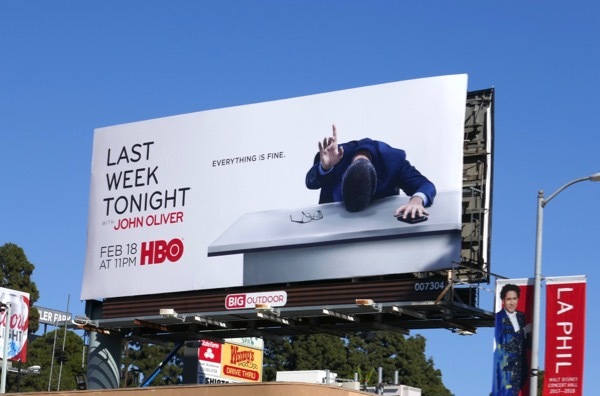 Every day seems to bring some new hell and sadly, or fortunately depending on how you look at it, fresh comedy fodder for late-night satirical shows who make their living getting laughs out of usually stuffy politics, news and current events. 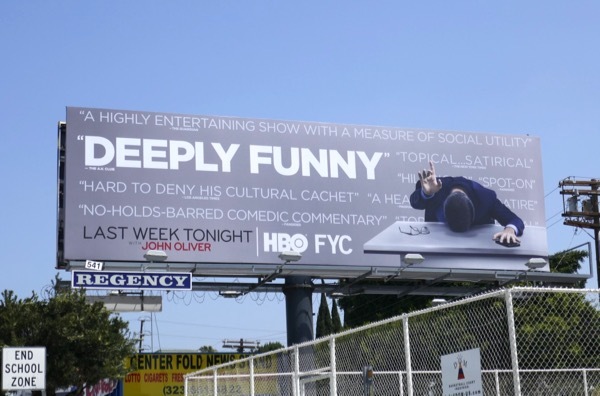 These hilarious season five billboards (yes hilarious, as consider how hard it must be to make a bespectacled British man in a suit sitting behind a desk funny season after season) were snapped along Bundy Drive and Sunset Boulevard from January 27 to February 11, 2018. 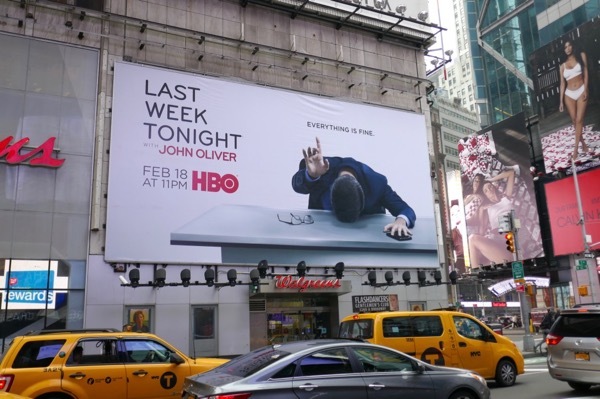 Fans of John Oliver's HBO show can also compare these outdoor ads to his previous season promo billboards for Last Week Tonight. 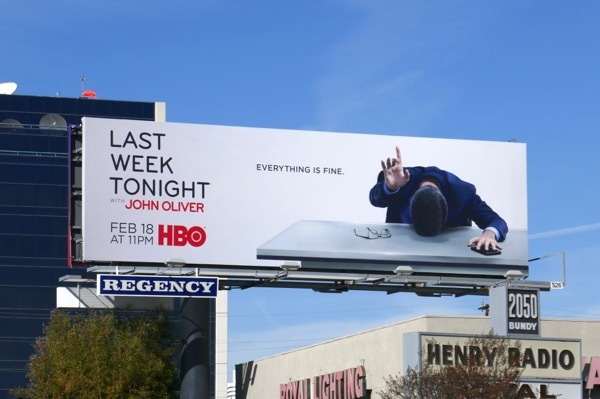 Let's hope it won't be long until we can get through a day without repeating to ourselves 'everything is fine' over and over. 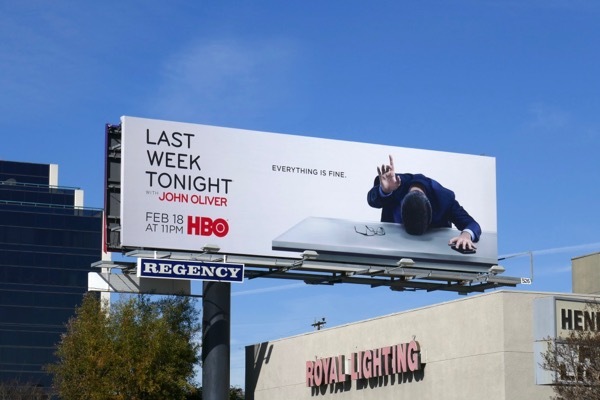 It's almost Mueller time. 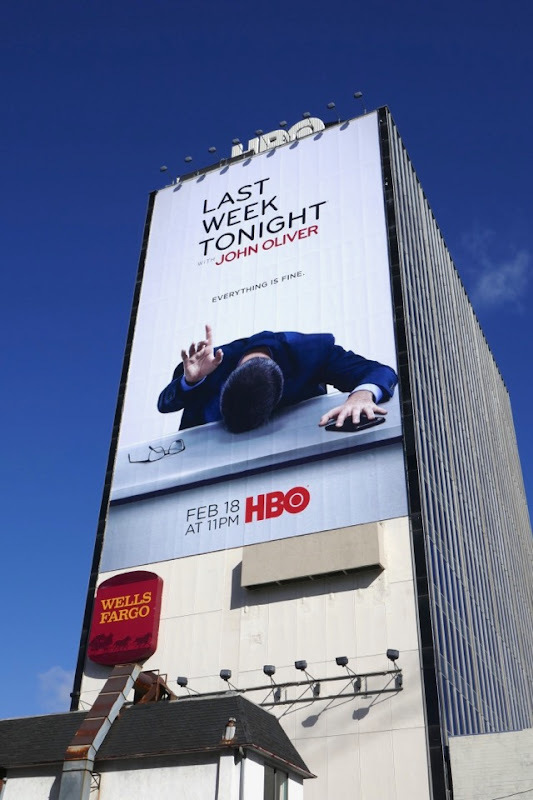 UPDATED: Here's also a season five billboard spotted in Times Square in Manhattan on February 15, 2018. 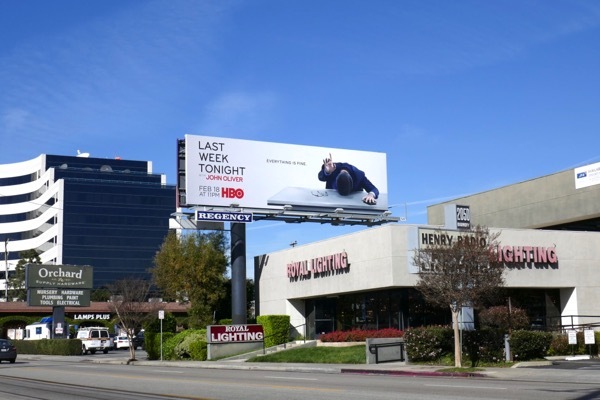 UPDATED: Can the Emmy-winning show add more industry accolades to its mantle with the help of this consideration billboard for its fifth season spied along Fairfax Avenue on May 10, 2018. 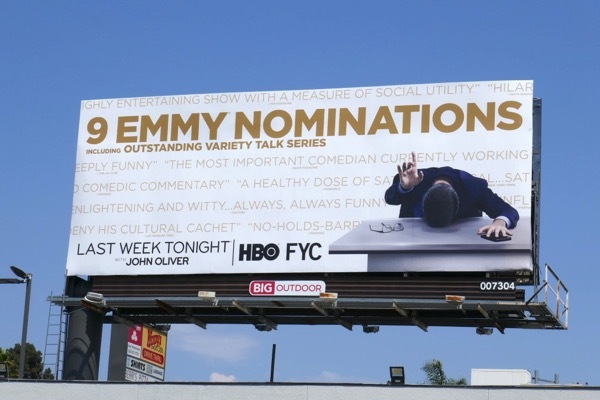 UPDATED: Congratulations to John Oliver and the show for garnering nine Emmy nominations this season, including for Outstanding Variety Talk Series (which they won last year). 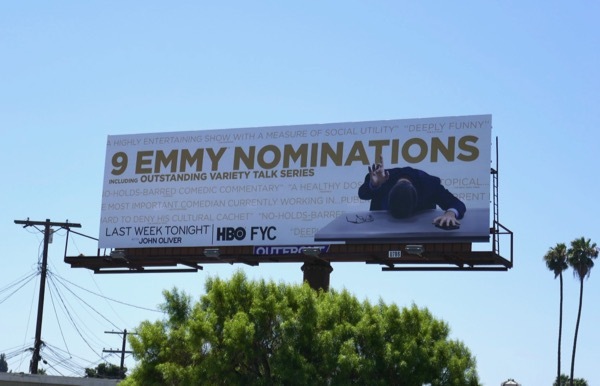 These Emmy nominee billboards were spotted along Venice Boulevard and Sunset Boulevard from August 6 to August 12, 2018.